My dad's 80th birthday was not that long ago. Instead of a cake, he requested that I make him a raisin pie. He grew up with his mom making these quite a bit. In fact I remember when I was little she would always make them whenever we got together for a big family gathering. And let me tell you our family gatherings were big! My dad had 10 brothers and 1 sister. 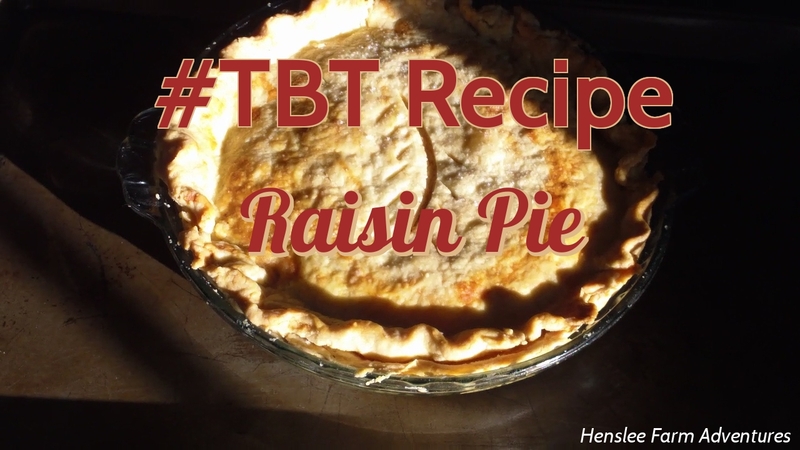 I used my grandmother's raisin pie recipe to make this, but I did use my mom's blue ribbon pie crust recipe for the crust. So this post is just about the filling. To me it is so good and not too sweet. And of course it brings back great memories of my grandmother. To start out you will need to boil the raisins in some water to plump them up. Here I have combined the water and the raisins and will bring them to a boil, then turn down the burner and let them simmer for about 25 minutes. While you are waiting on them to cook, you can go ahead and roll out the pie dough. After that mix together the sugar, corn starch, and pinch of salt in a separate bowl to add to the raisins later. After the raisins have simmered, add in the lemon juice, and the butter and stir. Then add in the corn starch, sugar, and salt mixture to the raisins and mix well. Pour it into an unbaked pie shell and top it with a top crust and bake it in a preheated 375°F oven for about 45 minutes. Be sure and check after about 20 minutes to make sure that the edges of the crust aren't burning. If they are, cover just the edges with foil and continue baking. Once done, take out of oven and let cool. I made this one day ahead of time. I normally like warm pie, but in this case I needed that extra day to have plenty of time to make the pie. And here is the pie at my dad's birthday party. I had just sliced it and was getting ready to give him the first piece. My dad taking the first bite. Baby Jasper wants a bite, Papa! Dad gave me the thumbs up on the pie. So glad that he liked it and that I could make it for him for such a momentous birthday! Check out my YouTube video of making this raisin pie HERE. And to print a copy of the raisin pie filling recipe, click HERE. I hope you all enjoyed this recipe. Let me know...have you ever had raisin pie?